New Music: “Can’t Get Started” — The Sharp Things | Pop That Goes Crunch! I wrote previously on Green Is Good, The Sharp Things’ release from earlier this year. It remains one of the best albums of the 2013, due to the band’s ability to stitch together such a dazzling array of different pop styles in a way that is entirely natural and seemingly effortless. The sunshiny and soulful “Flowers For My Girl” is also one of my favorite songs of the year. You can still get Green Is Good as a “name your price” download on Bandcamp. You certainly should do so, and at least put a couple of dollars in the tip jar. 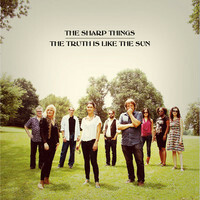 The band has another album, The Truth Is Like The Sun, slated for release this year. The first single, “Can’t Get Started,” was uploaded to Souncloud recently. It’s a brilliant follow-up, and follow-on, to the chamber pop stylings of Green Is Good. “Can’t Get Started” is piano-driven throughout, with multi-layered vocals, an occasional strike of the guitar, a handful a string flourishes and a slight crescendo of percussion and wall of sound at its conclusion. Its simply gorgeous. Pingback: The Sharp Things Deliver Some Sonic Truth | Pop That Goes Crunch!